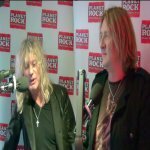 Def Leppard members Joe Elliott and Rick Savage answered fan audio questions for Planet Rock last week and the video is now available. Joe and Sav were both in England last week to promote the film and it's CD/DVD/Blu-ray release. They answer various fan questions about the Heroes tag in Hysteria, cars, early Sheffield venues, lyric inspiration, remaking promo videos and memorable live shows. Plus a small comment on the possible second Las Vegas residency. "You may see us next year which is a very big possibility because they've asked us to go back. Maybe next year or the year after we're not really sure." "Well they've asked Ded Flatbird, I don't know about Def Leppard but apparently Ded Flatbird have been invited."